Located in the “Heart of America,” Sioux Falls is South Dakota’s largest city, within a day’s drive of most Midwestern cities. 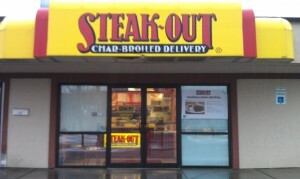 And just outside of the Sioux Falls downtown city center is Steak-Out Char-Broiled Delivery. No matter if you are native to the area or a visitor to our beautiful city, if you are looking for a delicious meal that delights, check out Steak-Out’s sizzling menu. You won’t find anything else like it in the Midwest. Each meal is specially prepared with Steak-Out’s special seasonings and secret recipe sauce. It is grilled over an open flame and packaged perfectly to ensure a hot, fresh meal delivered directly to your door. So whether you are kicking your shoes off after a long day at work, or settling in after a long day of touring, give Steak-Out in Sioux Falls a call or order online and let us cater to your growling stomach.